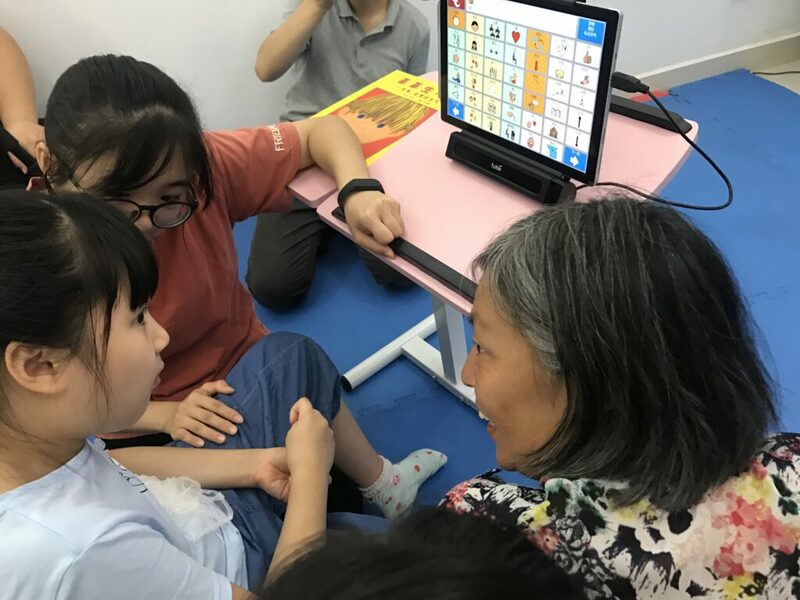 Speech therapist and doctoral student Helena Wandin reports on a couple of intensive July days in China when she was involved in introducing gaze controlled computers to girls with Rett syndrome. Our vocabulary develops during our entire lifetime, hopefully, and in summer I learned a new expression: Shenzhen speed. Until not so long ago, Shenzhen in southern China was just a humble fishing town, but it is now one of the most modern cities in China. Construction and growth are taking place at a tremendous rate, hence the expression Shenzhen speed. I participated in the start-up of a project to introduce gaze controlled computers and symbol communication to six girls with Rett syndrome and their mothers. The families attended during the first four days and during the last two days the teachers and I met to discuss the continued AAC work. To begin with, the parents received information about the hardware and software, and during the first day we prepared the following days’ group activities. We went through, and practised, modelling symbol communication on the computers. We were all fairly nervous before we started. The Chinese vocabulary available in eye-gaze computers was completely new to me. I had an English version of the vocabulary and the families had a Chinese version. Not the best of conditions to begin with, in other words. But we had two fantastic volunteers who helped us with translating. In spite of the language barriers, the mothers were immediately modelling with the gaze controlled computers and the girls gradually started to explore the vocabulary themselves. We also used paper charts containing the most general words and phrases. On the second day, the children chatted away so well that we all laughed and were moved. Of course, there was a great deal of exploring this new system, but a lot of what the girls expressed was also spot on. The project is part of the work being run by RSCRI to support children with Rett Syndrome and their families. 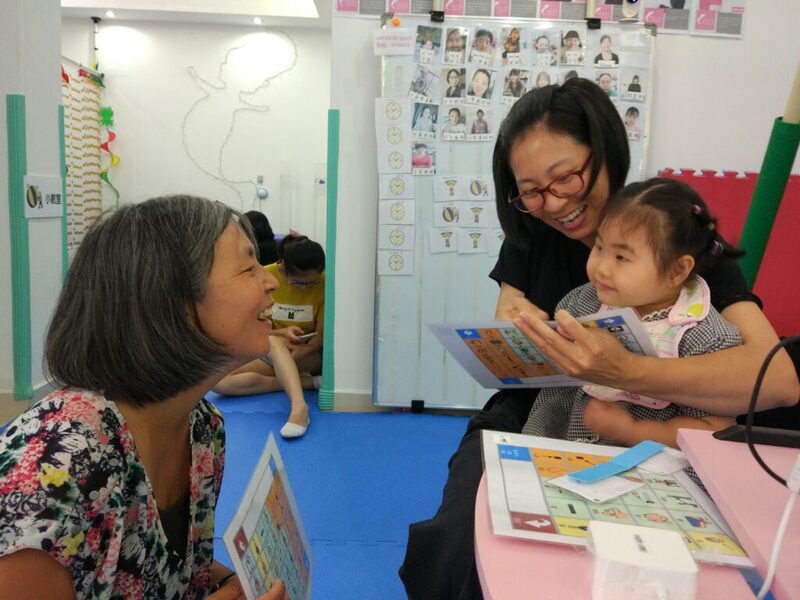 Currently, the institute consists of the founders, Inga Li and Michael Tan, who themselves have a daughter with Rett syndrome, two teachers and an administrator. A number of volunteers are also linked to the institute, including Yuming and Mei who interpreted during the course. RSCRI has worked together with an Australian research team and has a close relationship with a local centre for matters such as physiotherapy. In 2016 a research project was carried out in conjunction with Professor ChiKang Yang and Doctor Wang from Donghua University in Taiwan, in which responsive communication, and choice making with objects and pictures were introduced. Since then, AAC has been a major part of a two-week training programme in which five families from different places in China participate each time. The institute also runs an e-health platform where it is possible to up-load training films and create group forums for families from the same region. • A two-year old who had shown fairly little interest in the computer sat next to her favourite friend, chose “I don’t like this”, looked at us and then laughed out loud, something she seldom does according to her mother. • Two of the girls communicated so diligently during the book-reading that the mothers laughingly hushed them. The mothers modelled, responded to what the girls expressed and gave them plenty of space to take their own initiative. Yes, it really did go at Shenzhen speed. This was partially because the girls were so social, curious and had relatively good eye motor skills. One of the largest contributors to the fast progress was also the fact that the mothers were so ambitious and instantly got going with modelling and using the communication aids, even in the evenings in the guest apartment. Of course, there still remains a long way to go before they will truly master the computer as a communication aid, but they are off to a good start. Just two days after the course was over, the families sent video clips showing how the girls were using the computers in conversations. And after this flying start, we will have continued contact via video-link. Before each occasion the families will send in a video film for feedback. I am really looking forward to following their progress, and I am so grateful to have been part of this project and have worked with so many committed and competent people.